This delicious risotto was made by my dear friend (and chemo buddy) Cairine who took pity on my broken leg (and on the fact I was home alone for the week ) and invited me over for dinner. What you must know is that cooking is not her forte (or so she says. I am beginning to doubt it, to be honest) so she was feeling slightly terrified at the prospect of cooking her favourite risotto to an Italian person who, on top of that, runs a blog. But she needn’t be, as it was simply delicious! AND she used her iron cast pot (see photo below)! I helped her to stir it and to add the stock but she did it all on her own. The proof I really enjoyed it is that it’s now on my blog. So well done Cairine and thank you for the inspiration!! I’ll definitely make it again! By the way the recipe comes from the Riverford organic farm website. Pod the beans, then boil for 4 mins. Drain, plunge into cold water and drain again. Peel off the outer skins ( Cairine didn’t bother with this and I don’t think it mattered! )and put the inner beans to one side. Meanwhile, heat the oil and half the butter in a large heavy-based pan. Fry the onion gently for 8 mins, without colouring. Add the garlic and rice and cook, stirring, for 2 mins. Turn the heat up slightly. Add the wine. Reduce the heat and simmer until absorbed, then add the stock a ladle at a time, stirring constantly. 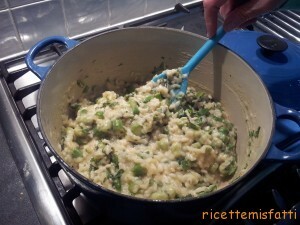 After 20-25 mins, when the rice is almost cooked, add the asparagus. Cook for another 3-4 mins. The rice should be cooked, but with some bite. Add the beans, the rest of the butter and the cheese. Season. Stir well, turn off the heat, cover and leave for 5 mins. Stir in the herbs just before serving. Ah, le fave, le adoriamo tutti a casa. E non sapevo si chiamassero fagioli larghi!!! 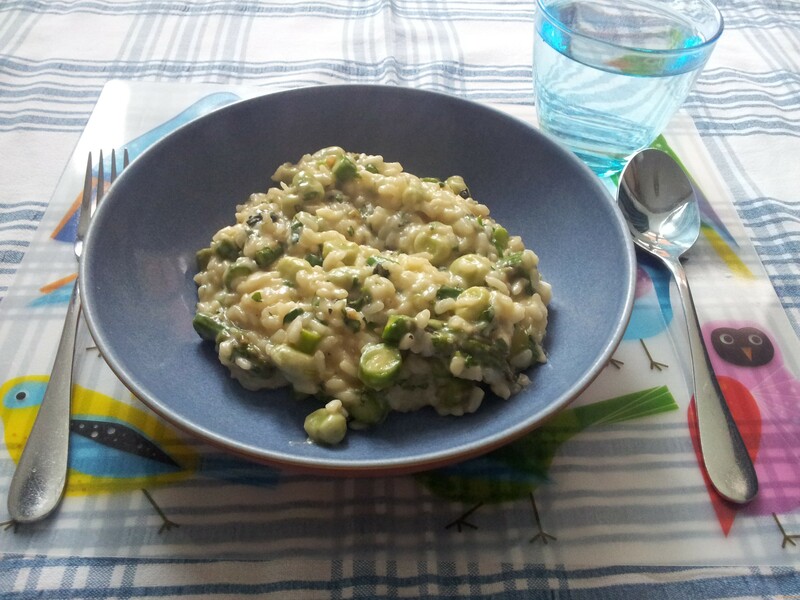 E’ anche bello questo risotto tutto verde!